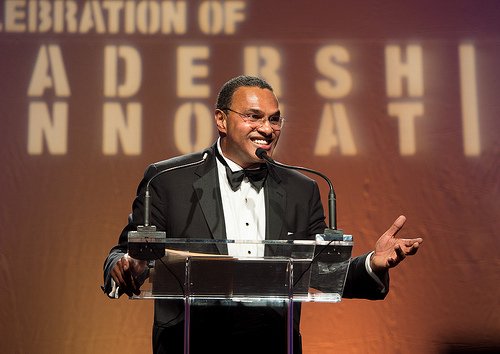 Dr. Hrabowski addresses guests at A Celebration of Leadership + Innovation, October 6. See more photos from the event here. I am delighted to share news of the tremendous support we have received from alumni and friends, the local community and businesses, and state and national leaders as we launch the Hrabowski Fund for Innovation. Over the last few months, hundreds of people across the state and nation have given of their time, talents, and resources, including about $5.5 million in gifts honoring President Hrabowski’s 20 years of dynamic leadership. Of that amount, more than $3 million was given in support of the Innovation Fund. Indeed, the outpouring of support recognizes the lasting contributions of UMBC’s faculty, staff, students, and alumni to the social fabric of our region, to Maryland’s economy, and to advancing public education nationwide. It also shows our supporters’ enthusiasm for the impact UMBC has had as a national model for excellence in teaching and learning across the disciplines. As many of you know, the Hrabowski Fund for Innovation will enable the University to invest in initiatives that reimagine what it means to teach and learn; challenge students to take an active role in their education; fuel creativity and enterprise; and transform classrooms into laboratories of the mind. The first Hrabowski Fund for Innovation Competition is focused on faculty initiatives, such as course redesigns, and is already underway. We received 19 applications for the spring awards, and a committee will select the inaugural recipients from that strong group by the end of this semester. As this next phase of our work gets underway, I hope you will join me in reflecting on how far we’ve already come and on the incredible appreciation the broader community has shown. All faculty, staff, students, and alumni should be proud of the contributions they’ve made to this gem of a university we call our UMBC.